I've watched Videodrome (1983) many times in my life (it's one of my Top 100 Films, David Cronenberg is one of my Top 20 Directors, and this is my favorite film by him), even as recently as 3 years ago when Arrow Films put out their excellent limited edition Blu-ray of it. But I've never quite noticed the political undertones to the extent that I did during this viewing (particularly allusions to The Manchurian Candidate (1962)). 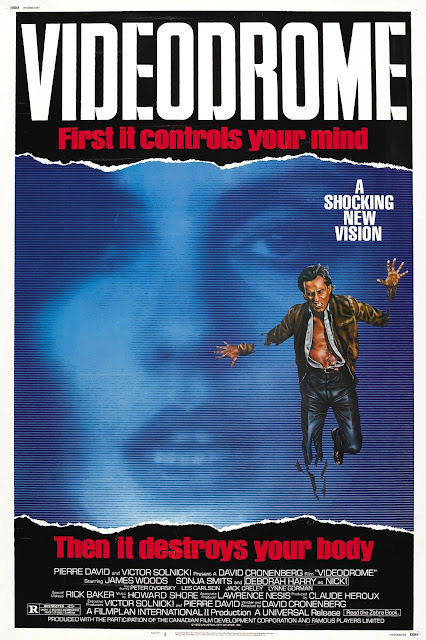 Maybe it's the times, maybe it's because despite some dated (but awesome) makeup f/x from Rick Baker and an outlandish plot, Videodrome, at its core,seems scarily closer to reality than ever. Or maybe it's just because these things are cyclical—the zeitgeist changes, level-headed people stay level-headed and power-hungry people never stop being power-hungry. You can find my David Cronenberg Feature Films Ranked list here. 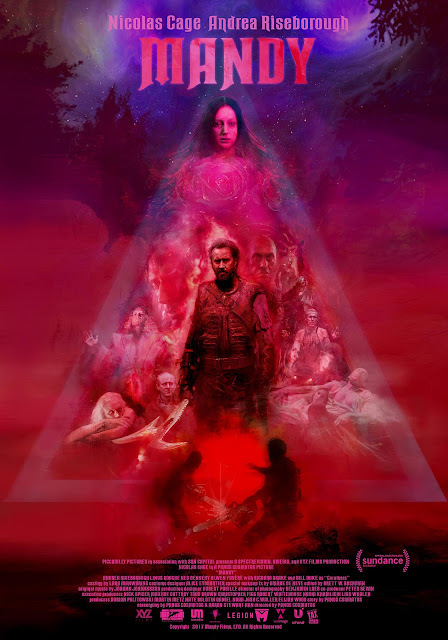 Mandy(2018) holds up well on "Take 2" and like any great film should inspire on repeat viewings, I liked it even more this go around (my initial review here). What stood out in particular this time was the humor throughout and also how I longed for more moments between Red and the titular character that we get so few of in the first half of the film. To paraphrase some thoughts by actor Linus Roache (who plays the villain of the piece), Mandy is a mystical, metaphorical, phantasmagoric tale of love and revenge from visionary (overused term, but truly applies here) director Panos Cosmatos. 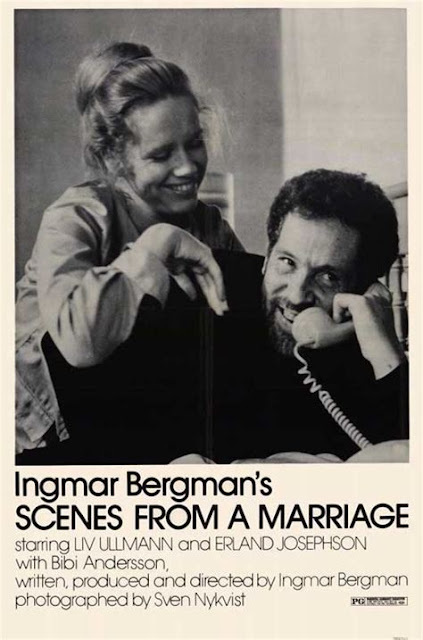 Scenes From A Marriage (1973) is a fascinating portrait of two very human beings that treat each other mostly awfully but most definitely love each other. Full of long philosophical discussions and uncomfortable moments, SFAMis a depressing and sobering watch but a terribly compelling one brought beautifully to life by its two leads, Liv Ullman and Erland Josephson and directed by one of cinema's true masters, Ingmar Bergman. You can find my Ingmar Bergman Feature Films Ranked list here. There really is no other film like 2001: A Space Odyssey(1968). No other film before and no other film since. And there really was no other filmmaker like Stanley Kubrick. Before or since. It's a film of impeccable style, grace, and patience, filled with gorgeous visuals, sumptuous and occasionally terrifying sounds, and ponderous and unnerving moments. It's the existential sci-fi film to end all existential sci-fi films, and one to spark endless theories. I had the pleasure of seeing the film in the new 70mm print earlier this year and this viewing, from the newly remastered Blu-ray, is just as gorgeous. It's definitely a step up from the previous BD. I bought the 4K package, but have yet to take that leap so it gives me something to look forward to—experiencing 2001 in 4K should be something special indeed. You can find my Stanley Kubrick Feature Films Ranked list here. 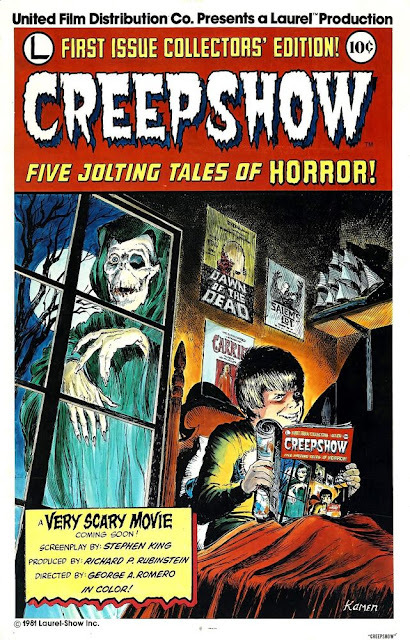 Creepshow (1982) is a hilarious, fun and (of course) creepy fright anthology that united two titans of horror, perfectly captures the look and spirit of the EC Comics which inspired it, and only gets better with age. You can find my George A. Romero Feature Films Ranked list here. For his third feature Damian Chazelle clearly chose a passion project. 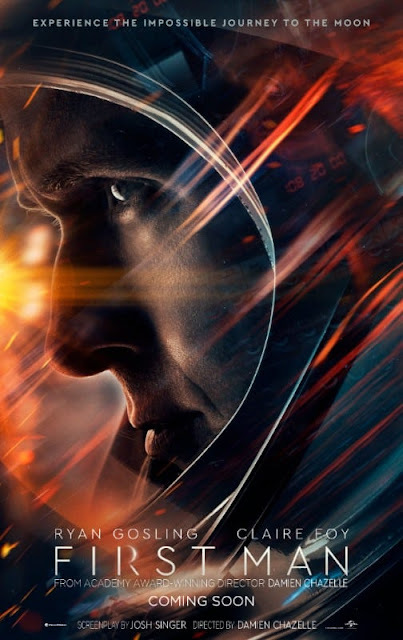 First Man (2018) is a technically very well-made film (despite a bit too much shaky cam for my tastes) about a significant historical achievement with a solid performance by Gosling but save for the tense moon landing itself it never really wows. 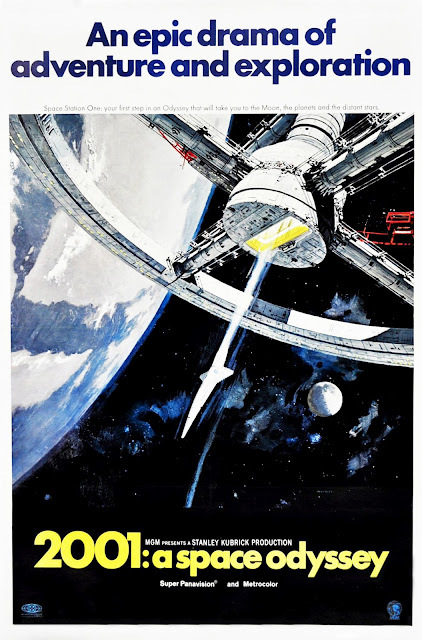 The score was quite good and I appreciate the understated quality but it kind of just made me want to watch The Right Stuff(1983) or 2001: A Space Odyssey(1968). 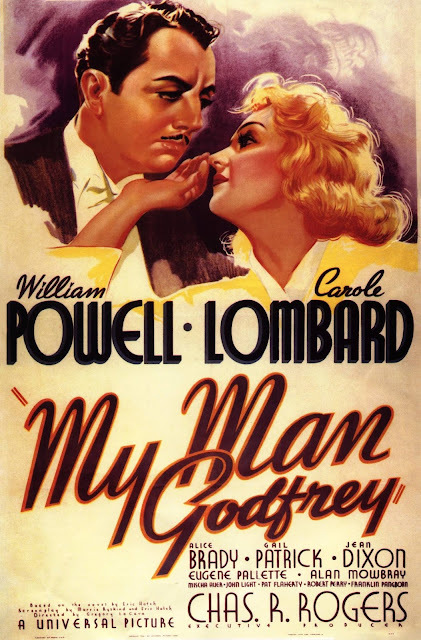 My Man Godfrey (1936) is a screwball classic about social class, humility, honor and love—featuring a terrific cast and full of hilarious zingers. A near perfect film with a brilliant script, incredible comic timing, and never a dull moment—including the superb conclusion. 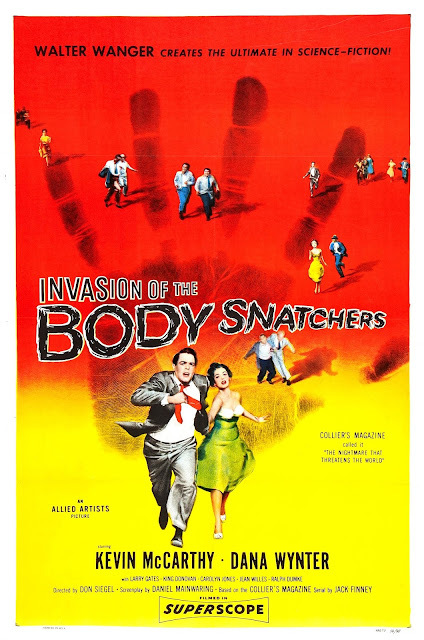 Invasion Of The Body Snatchers(1956), the first of four film adaptions of Jack Finney's 1955 novel, is a classic tale of fear—of conformity, loss of emotion, and loved ones being replaced by soulless "pod people". Despite some dated melodrama, IOTBS holds up very well, thanks to a cast and crew that created an indelible piece of horror/sci-fi cinema on a small budget in just a few weeks. BodySnatchers employs great economy, setting up its plot quickly and accomplishing more in 81 minutes than a lot of films do in 2 hours, without ever feeling rushed—thanks to a breakneck pace that keeps the tension high, resulting in a memorable and highly influential movie. A reboot/sequel of a classic film in a beloved series that was already rebooted/remade (in 2007) was always going to have strikes against it and be overly scrutinized. 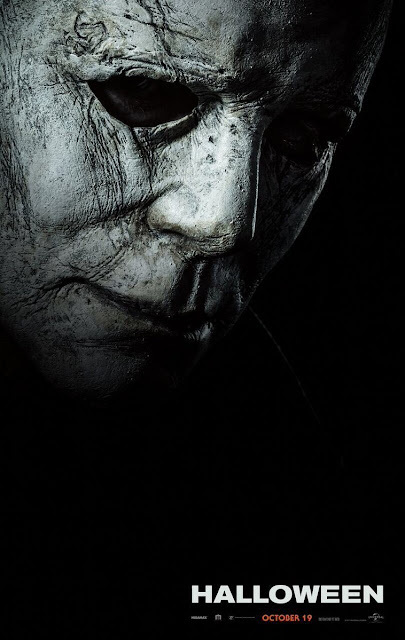 But as someone who doesn't hold the original 1978 film (and definitely not the series) in quite the same high regard as most horror fans (*ahem* Black Christmas(1974) is better), I am satisfied with Halloween (2018). 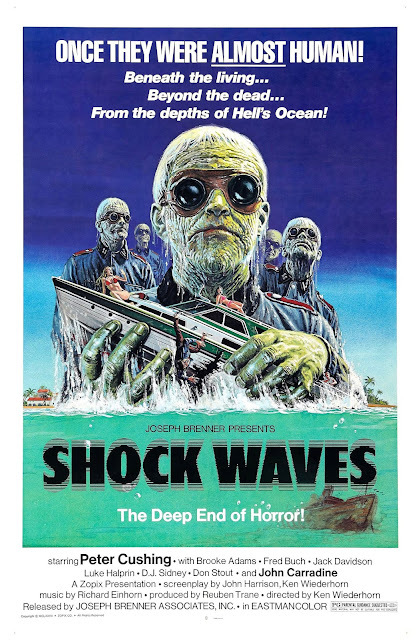 Despite having a great theatrical poster and a decent premise, Shock Waves (1977) is neither shocking nor does it really have many waves (though you may go through waves of boredom sitting through it). I'd seen this film before and it was just as snoozy as I'd remembered it. It wasn't the first Nazi zombie film but it may be the most lackluster. Once again, two months since the last DB Mixeswere posted, and on the 16th day of the month, I present to you: DB Mix Series 4 – Electric Connections. For those unfamiliar with these music challenges—my cousin Bryan and I alternately choose a concept, we each choose the appropriate number of songs, make a playlist, share with each other, then I mix the playlists, design the album art, and share with you! You can check out the previous DB Mixes here. The concept this month was chosen by me—each of us was to make a 20-song mix where the preceding song was connected to the next one by a person—whether that be the main artist, a musician, producer, engineer, etc. The main rules set down were that we could not use the same artist (for a song) more than once and we also could not use the same person as a connection more than once. 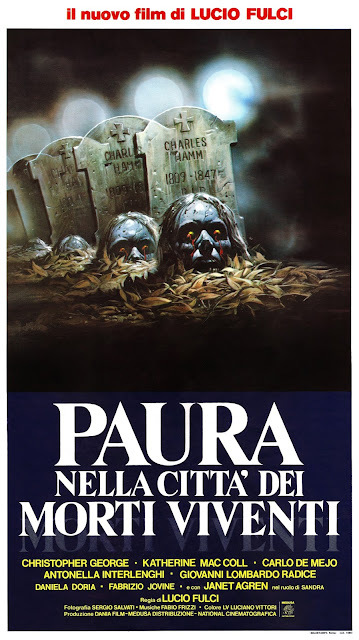 City Of The Living Dead (1980), the best of Lucio Fulci's four "undead" films made between 1979–1981, is all guts 'n ghouls 'n drills 'n maggots. It's not as iconic as Zombie (1979), it's not as atmospheric as The Beyond (1981), but it has the benefit of not having a main character portrayed by an insufferably annoyingly voiced child actor, as is the case with The House By The Cemetery(1981). The plot is pretty loose, but doesn't strike me as all that important—what matters is getting the characters from one gory Lovecraft-inspired set-piece to another. And though its tone is grim, City is a whole lot of fun. It also features one of Fabio Frizzi‘s best and most memorable scores. You can find my Lucio Fulci Feature Films Ranked list here. I'll be performing in this show a week from today—hope you can make it down! 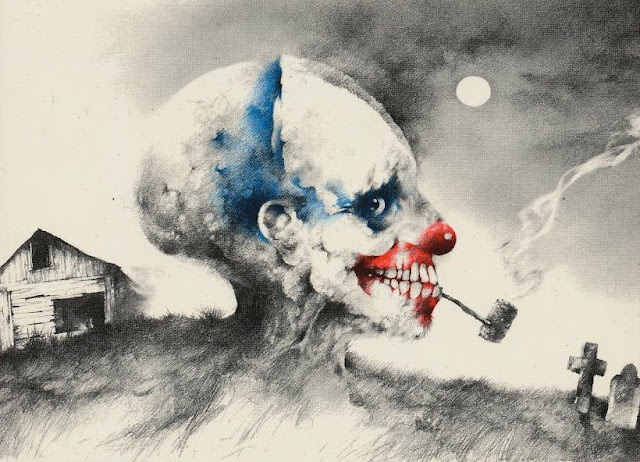 This Halloween season, join us at the Mediator Stage for a live storytelling event featuring selections from Alvin Schwartz's Scary Stories to Tell in the Dark trilogy. $5 suggested donation with all proceeds to benefit the Day One Sexual Assault & Trauma Resource Center in Providence. We'll have autumnal refreshments with vegan and GF options (donations appreciated!) and locally made Halloween crafts will be available to purchase. 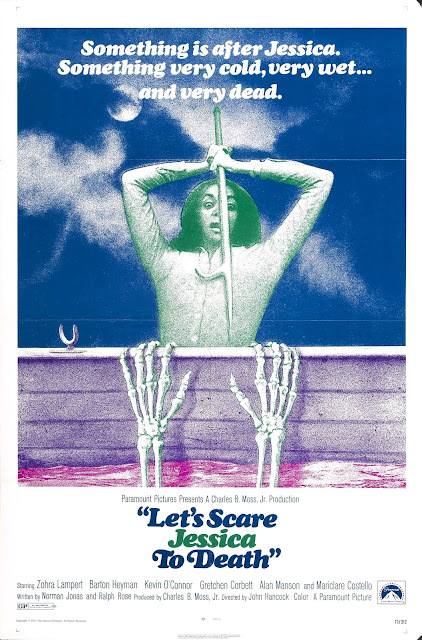 Let’s Scare Jessica To Death (1971) is a melancholic exploration of mental illness that’s a little short on plot but has an appropriately creepy vibe. The actors aren’t amazing and some scenes come off a bit clunky or goofy but I appreciate the ideas behind the film—what is in the titular character’s head vs. what’s real? At times I was reminded of Polanski’s Repulsion (1966) but the psychedelic tone and editing style of Jessica is most similar to George Romero’s 70s output—The Crazies (1973) and, in particular, Martin(1978). 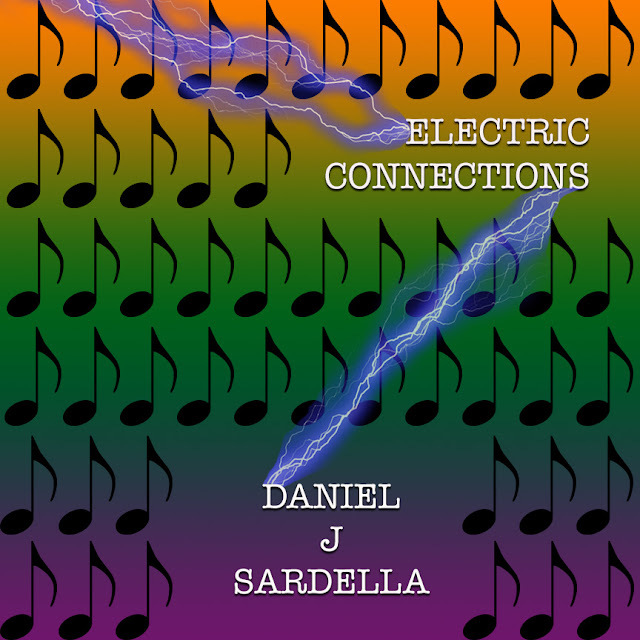 The eerily atonal synth and piano—which serve more as chaotic sound design most of the time than a true score—create a foreboding atmosphere. Despite (or perhaps because of it) being a product of its time (and having a title that doesn’t really make sense), and with a little more finesse, Jessica could have been a true cult classic, but it's still worth a look. 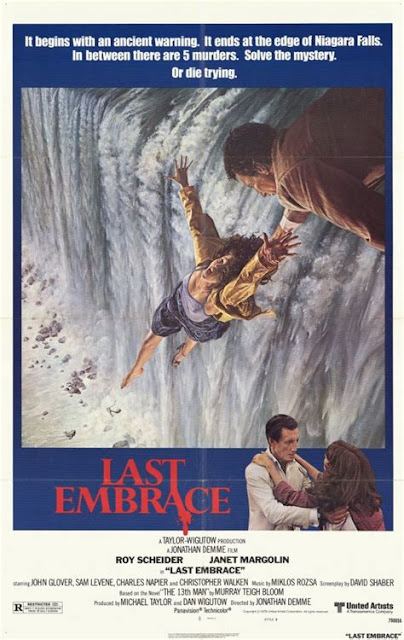 With Last Embrace (1979), Jonathan Demme tries his hand at a mystery/thriller in the vein of two titans of the genre but it’s missing the sense of humor and adventure that Hitchcock had and the melodrama and technical wizardry of De Palma. It feels a bit too much like a copy of a copy (a bunch of MacGuffiny stuff in the first half and callbacks to Hitch films galore), lacking both the charisma of a lead like Cary Grant or Gregory Peck and the audacity of De Palma’s grand set pieces but it’s still a fun flick with a solid cast—including Roy Scheider, doing his best to one-up Grant's leathery tan, and Janet Margolin, who does a hell of a job bouncing between mousy and femme fatale. Miklós Rózsa (who scored many a great film from the golden age of Hollywood, including the greatest film noir of them all, Double Indemnity (1944), and Hitch’s own Spellbound (1945)) is on hand to provide music. For fans of North By Northwest (1959), Vertigo (1958), and Obsession (1976). 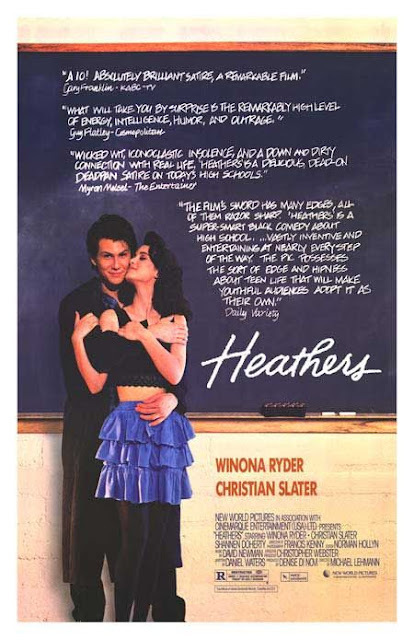 Heathers (1988) is like a John Hughes movie with more bite—a dark high school satire that still feels relevant 30 years later (and not just to high schoolers). Without Heathers there would be no Election(1999), no Mean Girls(2004), probably no Kevin Smith. While it's not showy, director Michael Lehmann and his design team infuse his debut film with a hyper-real style that has aged quite well. It's no surprise that Batman Returns (1992) is my favorite Batman film and superhero film, because it was also written by this film's writer, Daniel Waters. Dialogue is Heathers' strong suit—honest, brutal, brilliant, hilarious, endlessly quotable—and the perfectly-cast leads (including Wynona Ryder and Christian Slater, only a few films into their careers at this point) deliver it with aplomb. 1977's The Pyjama Girl Case(La ragazza dal pigiama giallo) intertwines a murder investigation (based on a real case in Australia) by a craggy retired detective (played, amusingly, by Ray Milland) with a seemingly unrelated portrait of a woman in decline (Dalila Di Lazzaro). At times it's seedy (though never terribly exploitative) but also has a somber atmosphere hanging over the entire film—our lead character Linda clearly suffers from depression. An oddly eclectic but excellent score by Riz Ortolani fluctuates between synthesized disco and melancholic string queues. While not a giallo in the traditional sense (black gloved killer, high body count, dramatic lighting/production design)—it's actually more of a domestic drama than anything—it's still quite good and distinctive within the genre. 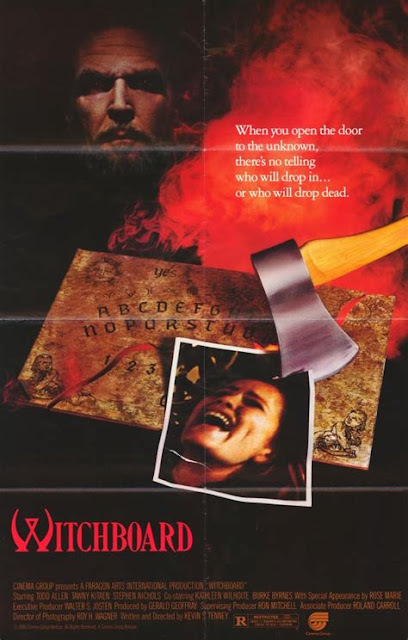 Witchboard (1986) has soap opera level acting, alternately shirtless or open-shirted lead males, Tawny Kitaen both naked and possessed, psychic humor, and most importantly—"progressive entrapment". It's not particularly good but it's particularly fun and funny with an audience. 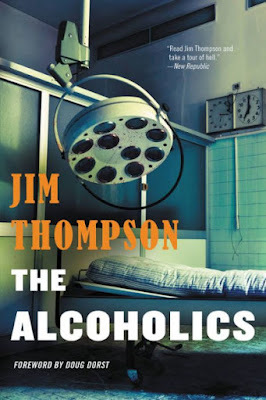 Jim Thompson's The Alcoholics(1953) is a short novel about a clinic called "El Healtho" in Los Angeles. At the heart of the book is Dr. Peter Murphy, who desperately wants to keep his clinic open—despite not having the money to—because he truly cares about curing his patients and he also doesn't want to be a failure. The characters that make up El Healtho are diverse and amusing (and this is one of Thompson's funniest novels) but I would definitely classify this book as one of Thompson's lesser works. Of course, lesser works by Jim Thompson are still very entertaining.